Nomad has been a fan favorite. 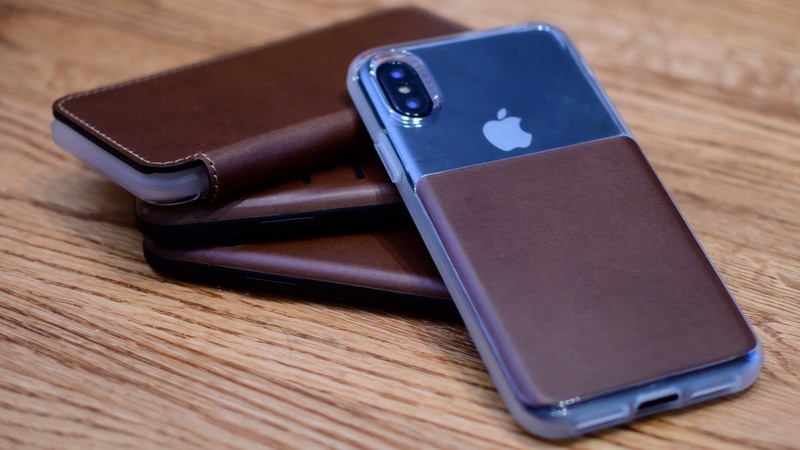 They recently released a new line of leather cases, specially tailored for iPhone X. 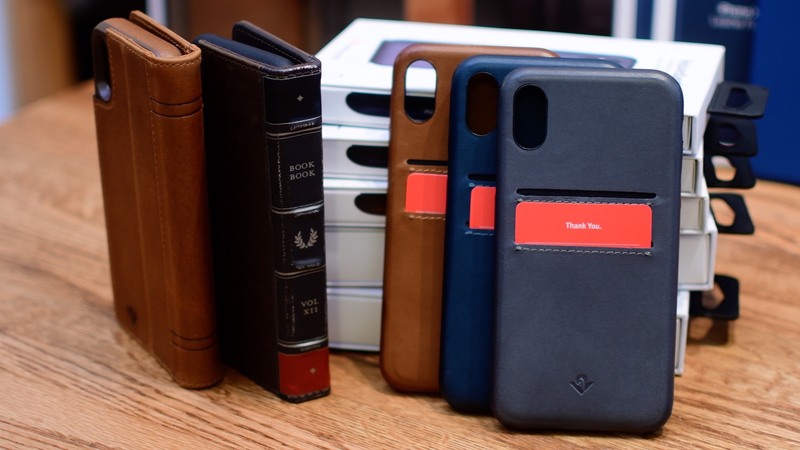 There is a folio style that has a leather flap with a clear shell on the phone, a full leather snap on case, a leather snap on case with card slots and a unique clear case with a leather patch on the bottom. I’m especially fond of the clear case with the leather patch. It isn’t something you see all too often, plus the leather is a great grip. All of the cases use genuine leather from the Horween leather tannery in Chicago, which is the same used in their watch bands. I’ve used their watch bands for a while and can vouch for the fact they age very well over time. Twelve South doesn’t have any entirely new case designs to go along with iPhone X. Instead, they’ve updated their most popular iPhone cases with iPhone X versions that are now available for purchase. For starters, there’s the BookBook, probably the case Twelve South is most famous for. BookBook looks like a vintage leather-bound book, but fits your iPhone inside. What is especially cool is that there’s actually a separate snap on case inside the BookBook that can be removed. So you can use just the shell or the full-on leather case. The Journal is a more modern version of the BookBook with a cleaner, simpler design. It too is capable of holding a few cards and cash, though the shell is not removable. Lastly, we have the updated Relaxed Leather cases. These use colors inspired by the fashion industry and come with or without card slots. For what it is worth, I’m currently using a Relaxed Leather are on my iPhone 7 Plus. Burkley is a relatively unknown name in the case world, but that shouldn’t really be the case (that wasn’t supposed to be a pun). I got to try out two separate cases, a snap on shell and their folio case, both crafted out of leather. The snap on shell is very nice, burnished leather shell. It has some nice color too it and feels great in your hand. The folio though, is what is really intriguing: it has a fantastic feel to it—a very soft, real leather. It opens up, and there is a medley of card pockets to the left and a shell on the right for your phone. What is particularly unique is that the shell is actually removable. The shell has a strong magnet that attaches it magnetically to the back of the folio, so you need not fret about it falling out accidentally. 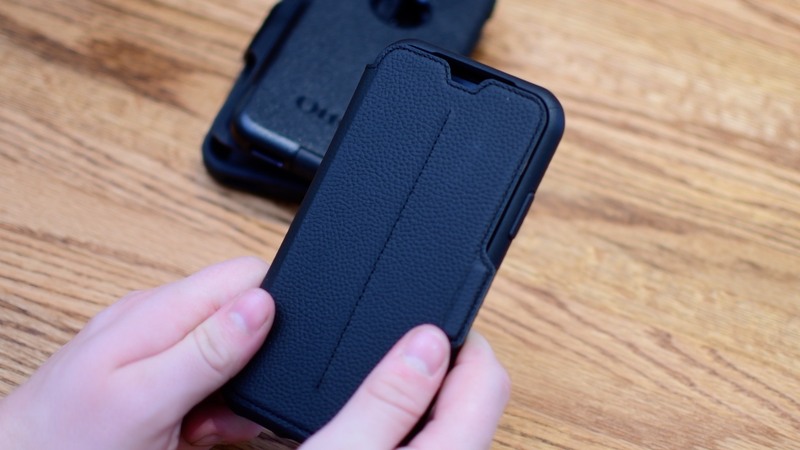 Compared to the Twelve South that uses a series of little clips to hold it in place, the magnets allow you Burkley to actually have a leather shell, with no holes on the back. It looks, and feels, fantastic. 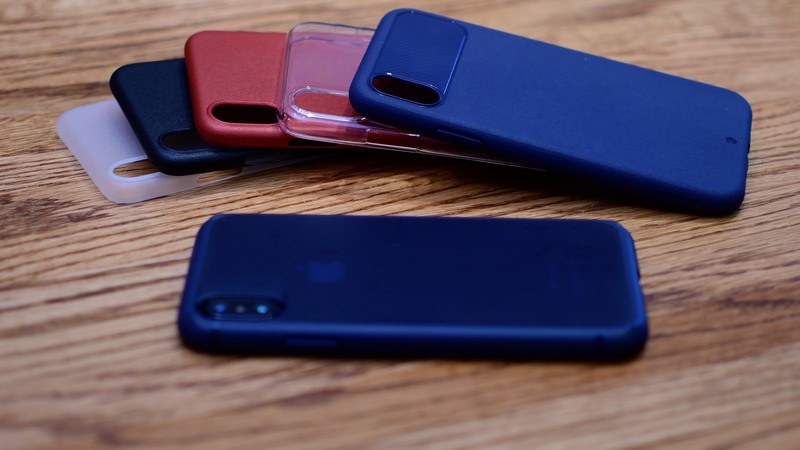 We looked at Apple’s cases, which include a new leather folio, a premium leather snap on shell and a durable silicone shell. The really intriguing one is the folio as it can automatically wake up the phone when you open it and lock it when you close it. Yeah, just like Apple’s Smart Cover for iPad. The other two are just updated versions of Apple’s cases available for past iPhone models. Mujjo created their iPhone X cases by starting from scratch. 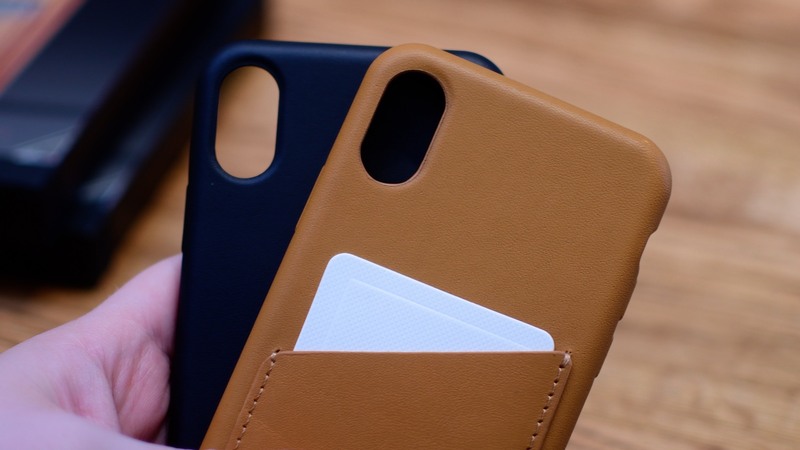 These cases feature an optional stitched pocket on the back that can handle two to three plastic cards. It’s also cut at a slant to make it easy to access. The case is fully wrapped in premium full-grain leather. On the inside, they use a satin-like Japanese microfiber that is super soft and super lightweight. I’ve used Mujjo cases in the past and I love their look and feel. Caudabe is known for creating thin, minimalistic and modern cases. That is true for their new iPhone X lineup. 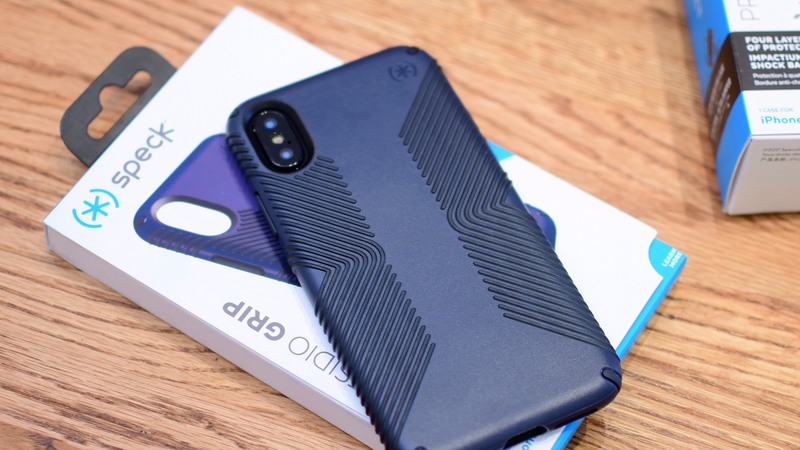 They have three different levels of protection, going from the absolute thinnest of cases to ten feet of drop protection. All while being slim and simple in design. The Veil XT is basically a removable skin for your iPhone X. It has a subtle micro texture on the exterior to help improve the grip at the same time as offering scratch protection. The Sheath is the second level of protection, offering two meters of drop protection, as well as a lip on the front and around the camera. For the most protection, the Synthesis is capable of withstanding a 3-meter drop. 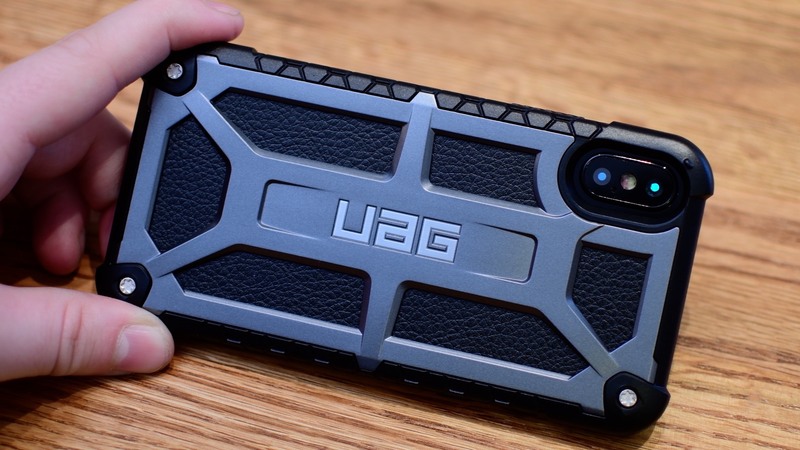 Urban Armor Gear has updated a few of their cases. My personal favorite was the Monarch series, a case made of several premium materials including metal screws, metal alloy body, impact resistant PTU on the edges and leather. It meets twice the requirements for military drop-test standards and sports has a honeycomb texture around the edge for additional grip. As a bonus, this case is compatible with Qi-based wireless charging. Alto cases are one of my absolutely favorites. They have a wide variety of bright, and vibrant colors. They have the more traditional brown and black, but I love the coral, and the lime colors. 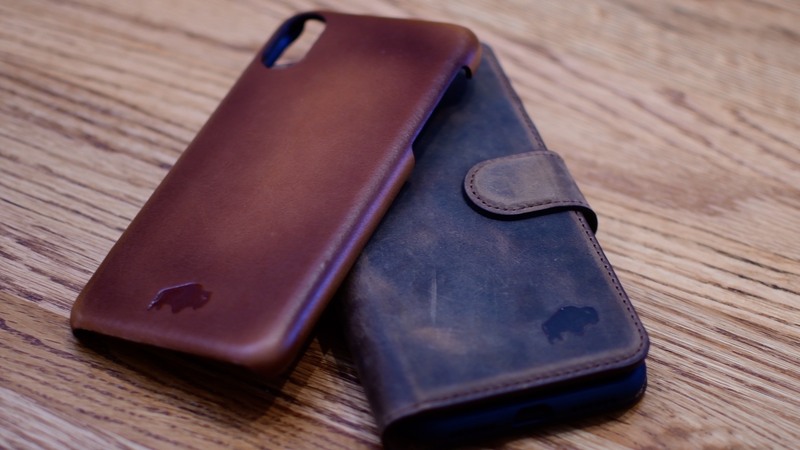 They really stand out from other leather cases we’ve seen. 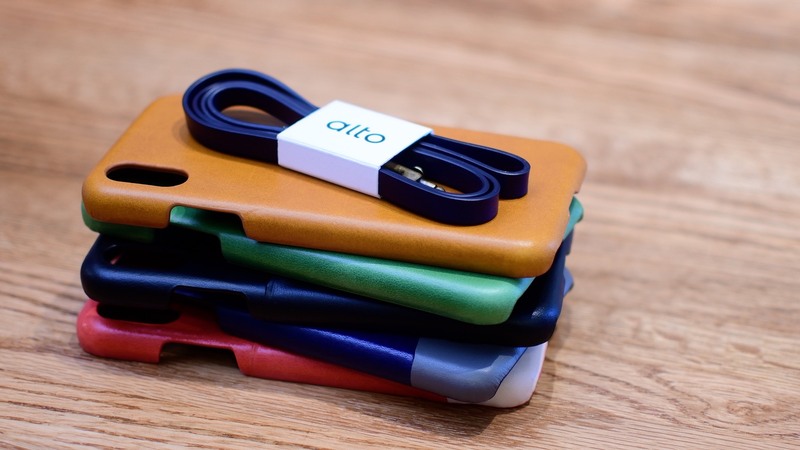 Alto cases also use a fine Italian leather in the creation of their case lineup, and it really sets them apart. It has a feel and finish unlike any other case. The leather is really nice, but can get a bit dirty of time. I used an Alto case for a while, and I just cleaned it with a standard leather cleaner and it worked great. They also have exposed openings for the bottom of the iPhone as well as the buttons. I really love that decision because it makes the buttons so much more tactile than when they are covered in plastic, leather or rubber. The cases offer a lot of protection while still allowing the best access possible to buttons and ports. They’re available with or without card pockets for carrying a credit card and ID with you. Another unique case is the optional clip that allows you to use a neck strap. This is awesome if you are taking photos in a precarious place or just want to keep your phone with you when you’re out at a busy place. X-doria has 3 different versions of their Defense lineup of cases. Lux, Shield and Clear. Clear is what it sounds like. It is very similar to the others, but features clear sides and a clear back. The Shield has a clear back with metal accents along the sides. The Lux sports the polycarbonate frame and metal accents, but carbon fiber on the back. X-doria made an effort to keep things as light as possible, while still offering protection. 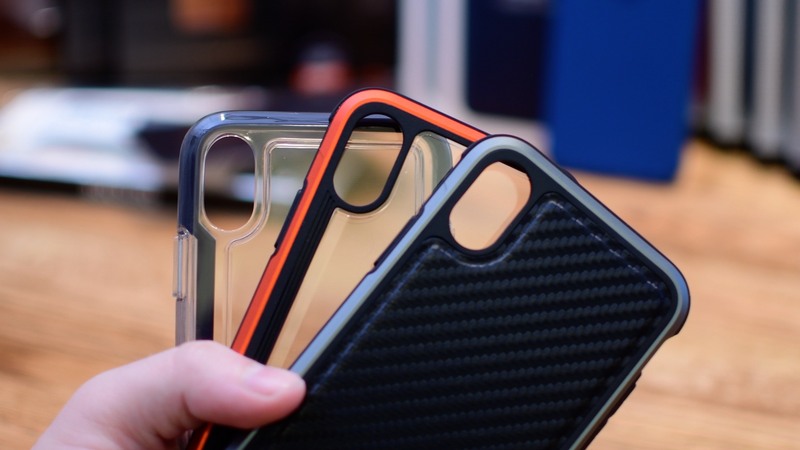 I have two Speck cases that I checked out: the Presidio Grip and the Presidio Ultra. The Grip is a lightweight case that feels great in the hand. 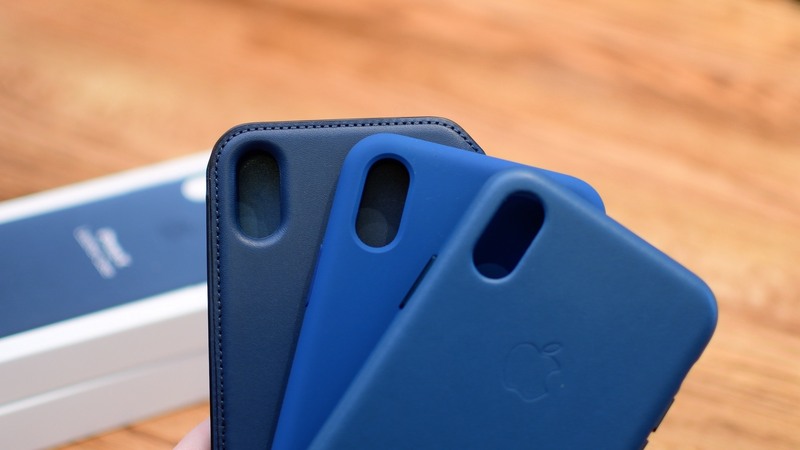 The design on the back is also texturized rubber to hold you hold onto your phone. I also happen to think it looks pretty great with its nice and slim design that’s quite protective. According to Speck, the case can withstand a ten-feet drop. I believe them because when you look inside the case you’ll see the ribbing going around the edges that will help absorb the impact (I’m glad you can’t see that from the exterior though). The Ultra, on the other hand, is more akin to Otterbox. It is a bit bigger, thicker and more protective. It features five layers of materials to help give it maximum protection while withstanding drops of up to fifteen feet. This case even comes with a holster you can use. OtterBox is offering its usual lineup of cases in time for iPhone X.
There’s the Defender, the most rugged of the three; the Commuter which offers a compromise between lots of protection and a less bulky case; and the one I thought was more intriguing, the Strada leather folio. The Defender is just as you’d expect. It has a lot of bulk, but a ton of protection. It can also be a bit difficult to get your phone in and out. I got the screen-less version so while all the ports were protected, the screen was not unless you use the included holster. The Commuter is similar to what we’ve seen before: a bit smaller, no holster, but still very rugged. The Strada folio I thought was really unique. It comes in black and brown leather so you have a couple options for color. The front of the folio magnetically attaches to the right side of the case, so you don’t have to worry about it coming open. Everything about this case feels secure and high quality. There are metal accents around the edge, like where the OtterBox logo featured. You can fit 2-3 cards easily enough inside the folio.